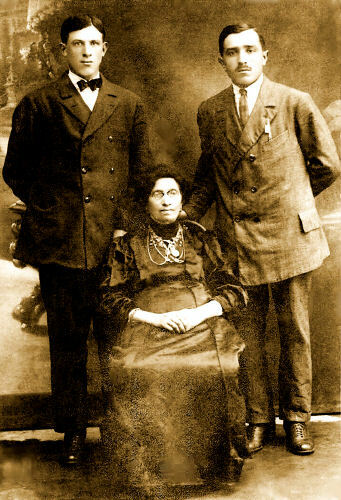 Sheina Gitel Burak, nee Drejarska, seated, with two of her sons: standing left, Charles (Yechiel) Burak, and standing right, his brother Samuel (Chone) Burak. Holocaust: Charlie and Sam (as they were better known) had already immigrated to the United States and were living in Brooklyn, Kings, New York before World War II began. Presumably, their mother Sheina Gitel, who did not emigrate and stayed behind in Jedwabne with her son Zelman and his family, most likely died during the 1941 Jedwabne pogrom. Sheina Gitel Drejarska married Aron Burak, who passed away between 1903 and 1905. It is for certain that Sam Burak (later Burack) emigrated from Poland and went to Cuba. The family feels that Sam and Charlie were inseparable, so it is possible that Charlie left Poland with Sam and also immigrated to Cuba. Under the provision (c) of the Immigration Act of 1917, Sam's record for legal entry for permanent residency in the United States was 15 Apr 1926. Nothing is known to this point about how or when Charlie entered the United States.